Just Cause 2 is a big blow-’em-up that urges players to cause chaos just because they can. My job is to mess things up. From the moment I parachuted onto the seething little southeast Asian island nation of Panau, I’ve been causing trouble. I joined up with rebels as they seized a nuclear power plant. I jumped atop the white limousine of a politician as it sped down a snowy mountain. I grappled with a helicopter in flight. I sent a soldier’s corpse cartwheeling with artillery fire. And whenever I needed another dozen grenades or a spare sawed-off shotgun, I just radioed my black-market supplier, and he airlifted them to my location like my own personal version of Wile E. Coyote’s Acme catalog of chaos. There’s a story here somewhere, and the more chaos I create, the more it’s revealed. While some games are driven by the accumulation of experience points or money, Just Cause 2 progresses via chaos. From the moment I’m dropped onto Panau, my job is to destabilize the local government. I do this by aiding local factions, fighting government soldiers and blowing, blowing, blowing stuff up. Anything that causes chaos causes the story — such as it is — to unfold. But the teapot tempest political plot isn’t enough to justify playing Just Cause 2. Plenty of games allow me to raise a ruckus in unstable societies. The fun of Just Cause 2 comes from the dramatic sweep of the action. One minute, I’m parachuting into an air base. Moments later, I hijack a harrier jet, take it into the air and blast the base’s radio tower. Seconds before an anti-aircraft missile reaches me, I eject from the cockpit and plop down in the bright blue ocean, swimming toward a passing tugboat as my plane explodes overhead. 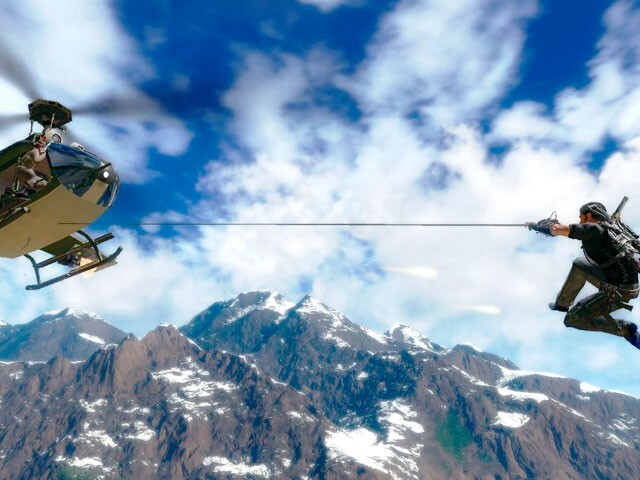 Just Cause 2 is a technical marvel when it comes to dishing out the disorder. It’s only during combat that the programming shows its seams. Soldiers are invincible when I try to shoot them through the driver’s-side window of their jeeps. But when they get out and start shooting at me (and missing — they have atrocious aim), I’m free to pick them off with headshots fired from arm’s length. A game that features so much gunplay could use some tighter combat mechanics. But then Just Cause 2 isn’t really about the details — it’s about the big picture, and blowing it up. THE GOOD: Just Cause 2 gets most of its momentum from a seamless combination of intimate and epic action. One moment, I’m skydiving above Panau’s rough-hewn mountains; the next moment, I’m targeting the unshaven cheek of a soldier between my rifle’s crosshairs. All of this happens without a break, transition or change in clarity. THE BAD: All this mayhem can get monotonous. Most of the game’s missions lead me into identically fortified government outposts, blowing up the same formations of fuel tanks and guard towers. And while I’m free to leave the missions as I please, fully completing each location usually involves me tediously checking behind every building as I seek out chests of weapons and stashes of cash. THE BOTTOM LINE: Just Cause 2 is a big blow-’em-up that urges players to cause chaos just because they can.